We're going to look at plant structure in this section. The plants we discuss will be vascular plants that have systems of tubes (xylem and phloem) for the transport of nutrients and water. Remember that there is a wide variety of plants on Earth and even a whole group that doesn't have vascular systems. Mosses and liverworts may still have photosynthesis, but they do not have that 'classic' plant structure. Then you will find species such as cacti that don't have leaves. They conduct photosynthesis in their stems. Anyway, just remember that there are many other possibilities in the plant kingdom. We just told you about the many exceptions to the basic plant structure, so let's look at some similarities. An easy similarity is on a cellular level. 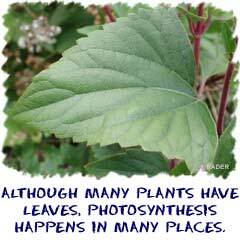 Plants conduct photosynthesis. This process of converting the Sun's energy into molecular energy happens in chloroplasts with the help of chlorophyll molecules and a variety of enzymes. Vascular plants share a similar set of structures called roots, stems, and leaves. Many plants have specialized versions, but the basics are there. One specialization might be the petals of a flower. Those flower petals are specialized leaves that surround the reproductive structures of the plant. We'll start at the bottom with the roots. These structures are designed to pull water and minerals from whatever material the plant sits on. For water plants, the roots may be in the water. For traditional trees, the roots go deep into the soil. There are even plants called epiphytes that live in trees and their root system clings to branches. Humans often capitalize on the roots of plants for food. Carrots are just one big orange root. Root systems also provide support for plants in the form of an anchor in the soil. If the wind blows hard, those roots keep the plant from falling over. Some plant species have roots above ground that provide support for the entire plant. Roots are further broken down into the primary root and lateral roots that each has apical meristem at their tips. Root hairs are also a common structure on roots. They make the roots look fuzzy and help in the absorption of water and nutrients. Sure we said that there are some roots above the surface, but the majority of the plant you see is made up of stems and leaves. Think about a tree. The stems are the trunks and branches. Leaves are self-explanatory. Stems are all about transporting food and water and acting as support structures. Leaves are all about photosynthesis, creating food molecules and absorbing carbon dioxide for the plant. These parts are connected by the vascular system of xylem and phloem that spreads through the entire plant. The tip (terminal bud) of the main stem has a specialized structure that is the source of new growth for plants. You will find the apical meristem that develops into young leaves (primodium). There are other points of growth at each node where leaves and branches develop on the stems. Those branching points are home to axillary buds that can also develop into new branches.